Wrapped stitch and double stitch short row heel turns go toe to toe (get it, hehehahahoho) in this blog post. Who will be the winner? But, never one to sit idly by and repeat the same technique, this time I wouldn’t do the double stitch short row heel turn. You might be wondering what a double stitch short row heel is, and I will blog about someday, but at this moment am boycotting because the ill-fated computer crash of November lost all my hard won double stitch heel turn pictures! In the interim, this blog has pictures, and I think it’s best described thusly; when you get to the stitch where you turn your work you knit that stitch, turn the work, slip the stitch purlwise onto the needle, and then yank the yarn hard until the two legs of the stitch wrap over the needle and form a double stitch. You later knit these two legs together eliminating the need for a wrap. But, I am a glutton for punishment and decided I would try the more widely known wrapped stitch short row heel turn. This technique is oft maligned and I was curious if it warranted the animosity. I read the instructions in my go-to sock knitting book. And I thought, ‘Ok, this makes sense.’ Slip, wrap, continue. And then I got to the part where it was time to add the stitches back into the heel. There was a lot of wrinkle deepening brow furrowing at that point. Wrap it again? Two wraps on a single stitch? That’s just insanity! And then I got it. Or, at least, I think I got it. Judging by the finished result I am not sure if I did it right. What do you think? 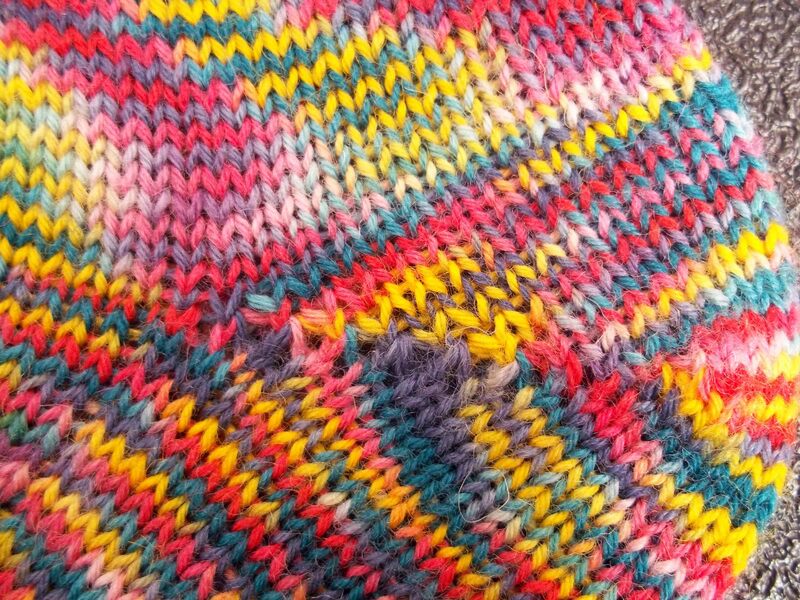 This is how the heel turn looks on the knit side of the short rows. This is what is looks like on the purl side of the short row turn. It's weird to me that they don't look the same on both sides, which is why I think maybe, just maybe, I did something wrong. 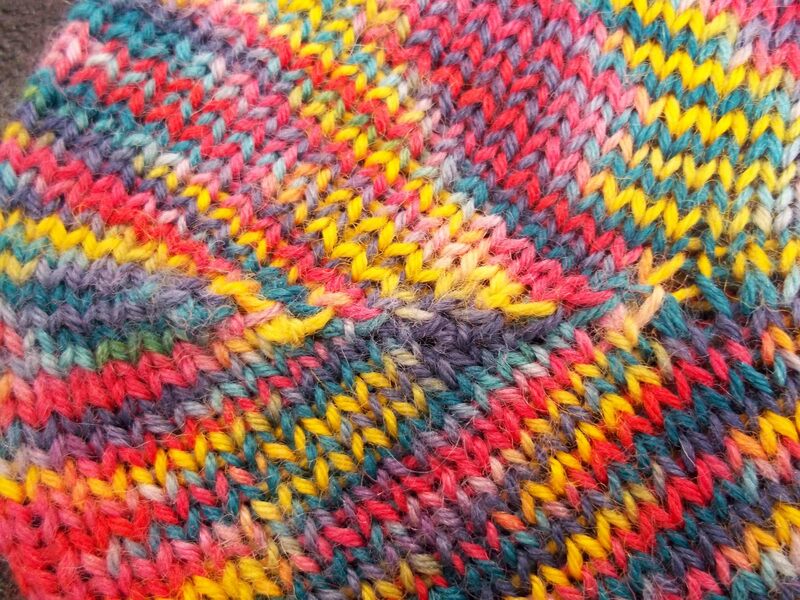 The thing that bothers me about this heel turn is the following 1) You can see the extra wrapped stitches. 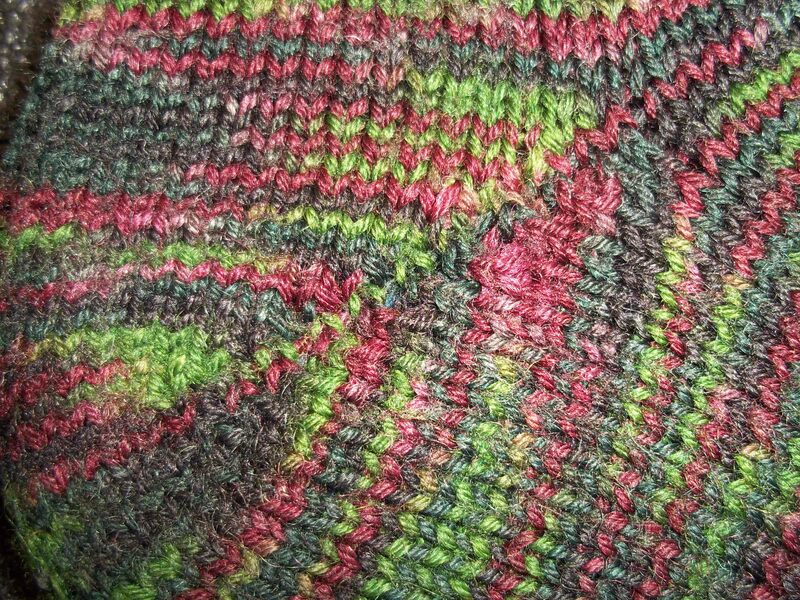 Error on my knitting part or just the nature of this heel turn, either way, I don’t like it. 2) Once you start dealing with two wraps it is really cumbersome and I got to the point where I couldn’t even tell if the original stitch was facing the right direction on the needle as I struggled to pick up both wraps. Enter the double stitch short row heel. So elegant in it’s simplicity and I think the end result is more elegant in design also. More elegant, easier, and the same on both sides. I present, the double stitch short row heel. And the winner is? Double Stitch Short Row Heel!!!!!! Hoorah!!! Like you didn’t see that coming. I am interested in your experiences. Have you tried both heels? What were your results? And, did I do something wrong on the wrapped stitch heel? I think I tested 13 different variations on the wrapped variety — all the ones I could find in various books, blogs and e-mags. I’m not sure you did anything “wrong” — it all depends on your source for instructions. There are so many ways to maneuver all those strands, and very often, one side doesn’t look like the other side, as you also found to your disappointment. IIRC the one I found in a popular e-mag gave me some of the worst results on that score. Now that I have found the double-st one, I haven’t gone back! It always pleases me to hear that the blog has helped out another knitter. I have big plans for a new & improved website overhaul this year!